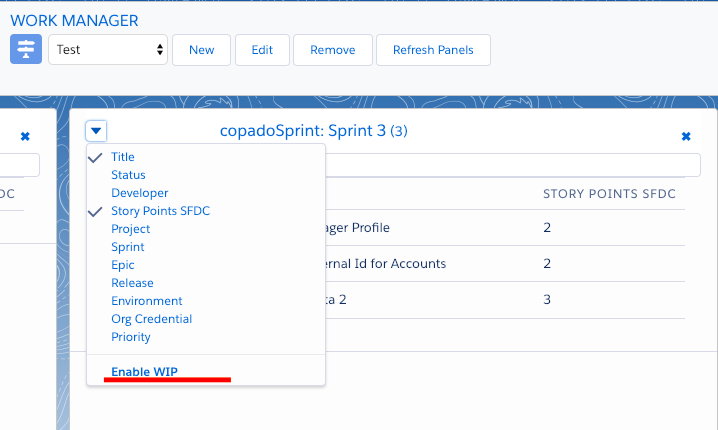 With Copado v12, the Work Manager page is capable of Work in Progress concept with the new style. When you open the page, if you click on the down arrow icon in the top left corner of the page, you will see the Enable WIP option at the bottom of the drop-down list. If it is enabled, then you will see min and max settings available in the top right corner of each table. If the min value is not reached on the table, then the table header will be shown as yellow. If the max value is passed on the table, then the table header will be shown as red. If the user story count on the table is between the max and min values' interval, then the table header will be transparent as before.